Extend safe swimming into the night. Turn on the Aqua Luminator Pool Light and watch your pool and its surroundings come to life! Comes with blue and green colored lenses which provide a dazzling color option for maximum backyard beauty and enjoyment. 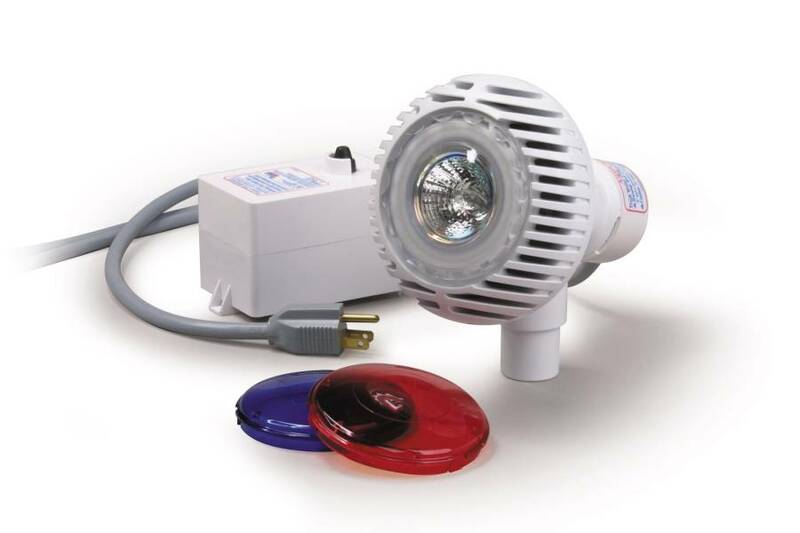 The Aqua Luminator Pool Light utilizes new Hydro-Optic technology combining safe halogen quarts lighting with the water return from your pump and filter in one easy-to-install fitting. Aqua Luminator Pool Light meets or exceeds every applicable standard for compliance to the National, Canadian and European electric codes. Research shows that the Aqua Luminator's advanced Hydro-Optics deliver 200% more light than a 50 watt halogen quartz light for above ground pools. The advanced bulb design uses 30% less energy than a 50 watt halogen quartz bulb and has a rated life of 3,000 hours. Easily installs through the pool wall in 5 minutes. Fits in your above ground pool's pre-punched hole. The Aqua Luminator simply replaces the old water return fitting, without having to lower your pool's water, and is UL listed Aqua Luminator Pool Light utilizes patented HydroOptical technology to create this revolutionary light and return fitting combination. The Above Ground Swimming Pool Light that's both a pool return and pool light. 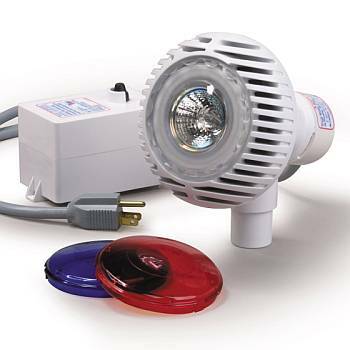 This low voltage above ground swimming pool light is built into the above ground pool return. Where you would normally place the standard above ground pool return, insert the Aqua-luminator. How it works is pretty simple, how it lights is fascinating. See for yourself by purchasing an Aqua Luminator Light with your above ground pool. See here for Owners Manual. Light and return fitting installs in as little as 8 Minutes. 200% brighter than incandescent lights. 25 ft. plug-in cord . Comes with Blue and Green Lenses.